So you already have, or you’re considering jailbreaking your iPhone. It may sound daunting at first, but jailbreaking is a perfectly legal practise and is easily reversible if you change your mind. There is no shortage of Apple aficionados who are content with the apps and features available on the iPhone 6. As always however, there are those who want more. Others argue that Apple is trying to monopolize technology, by only allowing users to install Apple endorsed software. The truth is, it’s your phone and you can do whatever you want with it. Jailbreaking will remove all restrictions set in place by Apple in regards to what software you can install and what changes can be made to the core functions of your device. This includes access to any apps that were not endorsed by Apple. As you can imagine, this opens up a range of exciting new possibilities, so here’s a short list of just some of the must-have benefits of jailbreaking. The main reason most people decide to jailbreak their phone is that it grants access to the Cydia Store. This is similar to the App Store and will likely be your go-to when it comes to looking for new software not available through Apple. Through this you can download anything from new fonts, new internet browsers, even a completely new user interface. Most of the software available is free, but just like the App Store, there are exceptions where you will be expected to pay. The key downside, as with all jailbreaking apps is the content is not approved by Apple, therefore it is advised to look up reviews of any software available beforehand to reduce the risk of installing a virus. Don’t you just hate it when you’re using an app and you get a text? Maybe you’re watching a video, or playing a game and then you have to either wait until you’re done, or close the whole app to go into your message menu so you can read it and reply. Well with a jailbroken iPhone, that’s no longer a problem. Available through Cydia, Quick Reply SMS lets you read and respond to new texts without closing your current window. Instead, your new message will pop up and you will have the option of replying there and then, or minimizing it for later. Not only does this work for texts and iMessages, but can also be set up to work for other messaging apps like WhatsApp. Ok, so you can already change your background on your iPhone. Have you ever wished the annoying speaker icon wouldn’t block the middle of the screen when you’re trying to change the volume? With this, you can change anything at all, including icons. For example, there are software packages available that let you relocate the volume display to the top or bottom of the screen so it’s less intrusive. You can even change the appearance of icons. Say you don’t like the logo of your service provider. Change it! 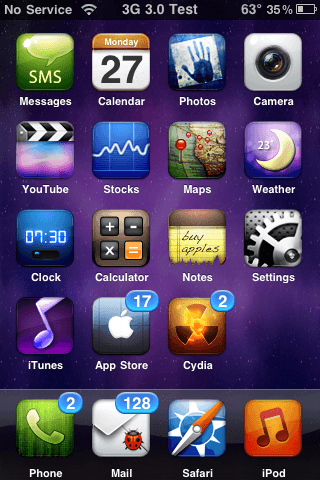 Also available on Cydia, is a software package called Winterboard that will let you download themes that completely change the style, feel and flow of your iPhone interface. Through this you can change fonts, layout and even add menus that weren’t there before, allowing you to do things like access all your messaging apps from one list. Catchy name, right? But what does it do? This one is a lot of fun. Activator is all about shortcuts. It allows you to assign gestures to control your phone. Instead of trawling through menus to open your favorite app, you can now open it instantly with a simple swipe of the hand. Activator lets you set up custom shortcuts for almost any action. You can even use the existing buttons, such as the volume controls. Using this you can take a picture, use the flashlight or switch the phone off instantly just with a touch of a button or a swipe of the hand. Many providers offer the option to tether devices in this way, but this generally comes with pricey monthly payments. MyWi lets you tether any device to your phone and share the internet connection for free. With MyWi you have a range of options for sharing your internet connection. You can turn your phone into a Wi-Fi hotspot, allowing any nearby device to connect wirelessly (not recommended for busy public areas unless you plan to use a password), or connect using Bluetooth or USB. Of course the possibilities are endless and this is just a very brief glimpse at what is on offer. The best bet is to try it for yourself. If you decide you don’t want your phone to be jailbroken anymore, you can reverse the process by connecting to iTunes and restoring your device. This should also revert any unwanted changes or malware you might have picked up.